Here is a List Of 9 Free CD Label Maker Software For Windows. You can make your own personalized CD and DVD labels using these software. These CD label maker software help you to design attractive DVD and CD labels according to videos, audios, and image files in them. If you have a huge collection of Disc and find difficulty to differentiate them, then use any of these software to customize their labels. This list of CD and DVD label maker software let you design labels using image, text, templates, animated image, colors, etc. These CD label makers help you design attractive background with your images or digital photos of your PC. Some software have their own collection of images, patterns, icons, etc which can be used instead of image. Disc can be specified by Title, Tracks, Artist Name, Album Name, Disc Title, Disc Artist, Number of Tracks, etc. You can also differentiate these text by font style, font color, font size, and font effect. Some of these CD label maker software let you design CD and DVD cover also. You can design cover and labels for many other disc types, such as: Standard disc, CD Jewel Cases, Multi-boxes, DVD cases, Slim Packs, Business cards, Maxi CD, BD cases, Mini CD, Biz card, etc. This article also explains how to design Labels for CD and DVD, how to create covers or labels for various Disc and how to design multiple CD label. I like Nero Cover Designer software the most. This free CD Label maker software has lots of features which make it unique. It lets you design labels for many disk types, with lots of inbuilt designs and patterns. You can also use your own images and digital photos. It has many settings which let you adjust images and patterns in a beautiful manner. Option to add any text with various font styles, sizes, effects, colors, etc are also available. You can also check out list of Best Free DVD Ripper Software, Best Free DVD Burner Software, and Best Free PDF To JPG Converter Software. 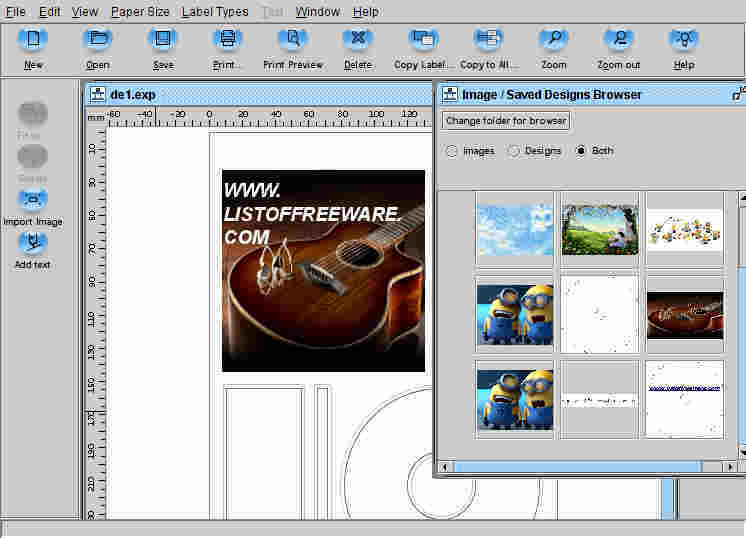 Nero Cover Designer is a free CD label creator and free CD label printer. This CD label maker software lets you design labels and covers for a wide range of disc types, like: Standard disc, CD Jewel Cases, Multi-boxes, DVD cases, Slim packs, Business cards, Maxi CD, BD case, Mini CD, Biz card, etc. You can add your own images, digital pictures, and other lots of inbuilt designs and patterns. It supports many image formats, such as: JPEG, PNG, BMP, PPM, PBM, etc. It lets you customize CD with Titles, Artist, Disc Type, Number of tracks, Disc Title, Disc Artist, etc, in various font size, font colors, font type, etc. You can also use Artistic text and various shapes, such as: line, square, rectangle, polygon, etc. DVD Label Maker is a freeware to create and print CD and DVD label. Here, you can design CD label and DVD label of various types. You can also design Traycard which can be used as CD and DVD cover. 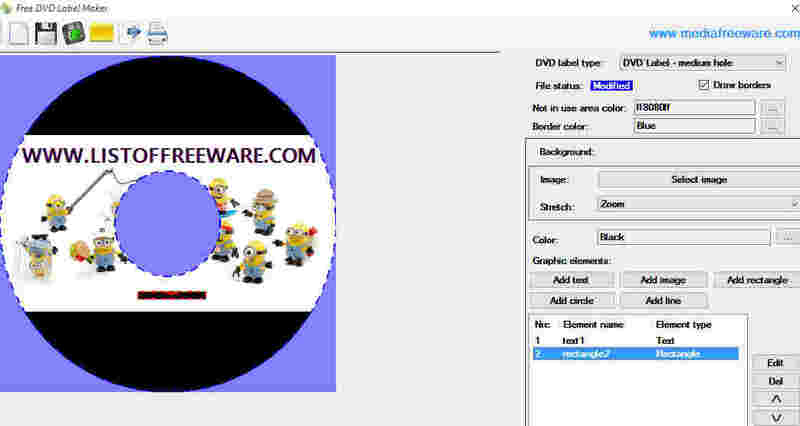 This CD DVD label maker software lets you use image and text. You can use any image from your PC as background and add text using various font style, font colors, font size, and font effects. So you can customize it as per your need. Image can be adjusted as Tiles, Stretch, Center, Zoom, and Normal. You can also add other elements like line, rectangle, circle, color, etc. Border can be added as outline for CD and DVD in label designing. 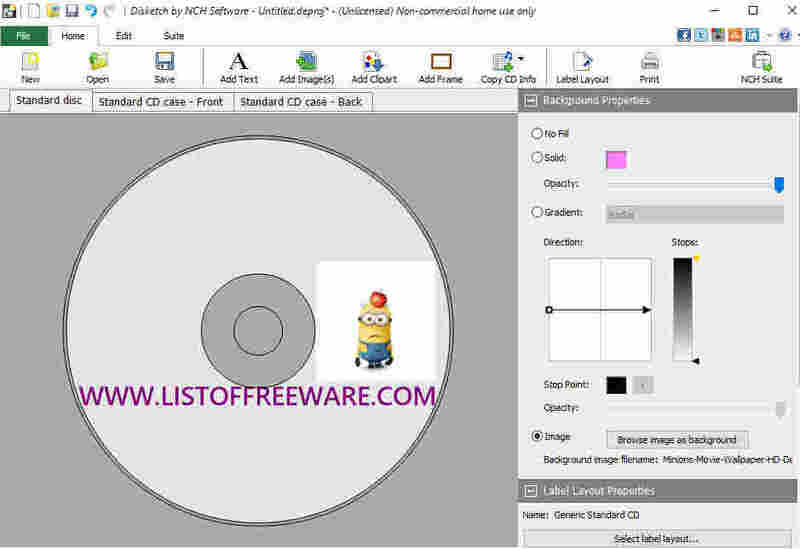 Disketch Disc Label Software Free is a free cross platform disc label maker software. It is available for Windows and Mac. This CD label maker software has a nice combination of tools for creating cover and label for disc like CD and DVD. You can create not only CD label but CD front and back cases also. You can add text, image, clip art, colors, and frame. It lets you edit font size, colors, font style, and font effects for text. This CD label maker software has a collection of label template which helps you to design CD label. You can add artist name, Track List, and Album Title by importing them from CD or DVD drives. You can share your design with your friends on Twitter, Facebook, google+, LinkedIn, and StumbleUpon. Brainative Disk Label Designer is another free CD and DVD label maker software. You can design label for Standard disc, Mini disc, Jewel case, and Mini case. It has simple friendly interface with few icons. You will find icons for editing background color, background image, and text. You can use any image and text as per your choice to design CD label using this CD label maker software. Various font style, font size, font colors, and effects can be used. This CD label maker can save your designed label in BMP image format and let you print it. 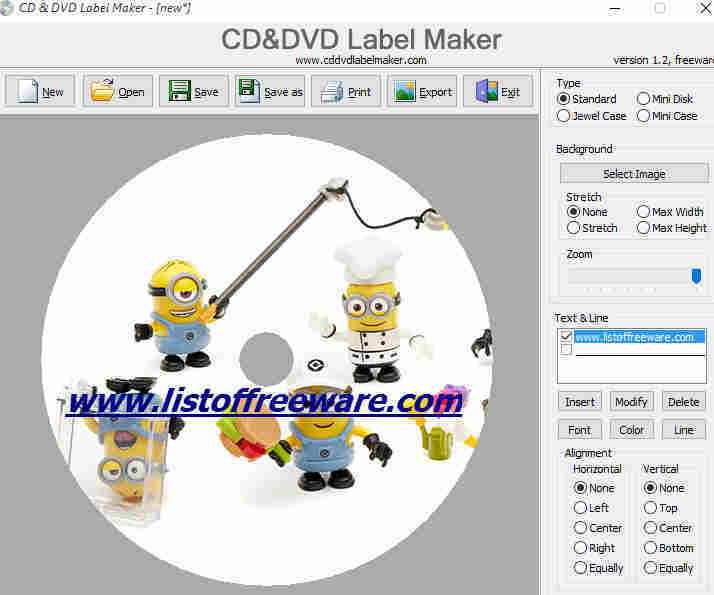 CD and DVD Label Maker Software is a freeware to design and print CD labels. It can design labels, jewel cases, and covers for DVD and CD. This CD label maker can design various Disc types, such as: standard disc, mini disc, Jewel case, and mini case. You can use your digital photos, images and many more. It supports JPEG, PNG, GIF, Bitmaps, Icons, etc. Adjust image with stretch and zoom options. You can add and modify a text with various font style, font color, font size, effect, alignment, etc. This CD label printer can save and print your designed CD labels. Disc Studio Labelling Software is another free CD label maker software. It has a number of template which let you design Disc label and cover in various styles. It also supports designing of many disc types, such as standard label, Mini disc, disc with various dimensions, Jewel cases, etc. You can use image, color, and pattern for background. It supports various image formats, such as: JPEG, PNG, GIF, TIF, TIFF, WMF, etc. It has a wide variety of tools and shapes to insert, such as: halo tool, line, rectangle, polygon, ARC, arrow, line, etc. You can use clip art and pencil as free hand tool for editing. Text can be used in various font style, font colors, font size, etc. This CD label maker save output as image in JPEG, PNG, and BMP formats. DRPU CARd And Label Designer is a free CD label maker software. You can design Standard CD, Mini CD, Rectangle, Round rectangle, and Ellipse. You can use text of various font style, color, effects, size. It lets you insert image of formats: JPG, PNG, BMP, TIFF, GIF, EXIF, etc. You can also add bar code, clip-art, various shapes, grid lines, etc. Note: It is a good freeware to design CD cover, label, and many cover labels in different shapes, but free version adds a small watermark. exPressit SE is an another free CD label maker software. It lets you design cover and labels for many Disc types, such as: CD, DVD, Mini CD, Business Card, MiniDisc, VHS Video, Floppy Disk, Cartridge, Jewel case, CD wallet, Slime Case, etc. It has lots of images and designs for CD label designing. You can use any of them, or use images from your PC. Add text with various font styles, colors, size, etc. Preview option is available so that you can preview your label design before print. UnderCover is a free software to create Disc label and cover. It can design cover and label of various disc types, such as: CD, DVD, VHS, CD back cover, CD front cover, Slimline DVD, Bluray CD, etc. It supports batch CD label Printing. First, you have to select CD label option to create CD label from list of Templates. Then click on Batch print option, which directs you to next level where you have to choose images for each Label. If you want to design 5 CD label at a time then select 5 images. Click on Print Batch. Before print, you can use rotate, and edit templates settings like Hole size, height, width, etc.